These traps have been made for DOC. Feral animals are a serious problem for our wildlife, native birds in particular. We have already produced 38 of these traps and have been asked by DOC to produce 20 more. These are currently being constructed. 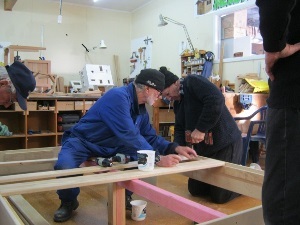 We built twenty queen sized bed bases for Christian Lovelink. 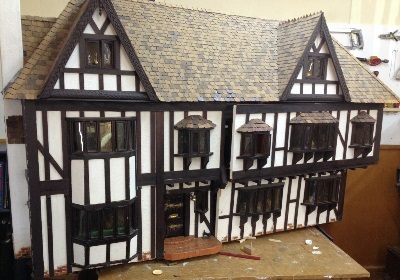 This dolls house was extensively refurbished for the Napier City Council. It has been returned to the Napier Public Library. 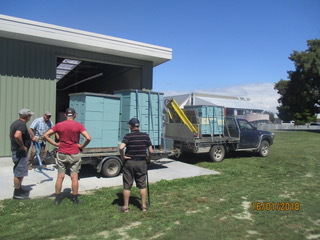 About four hundred bee hives were assembled and painted in record time. 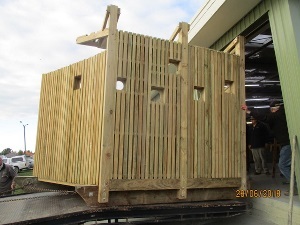 This bird viewing hide is another project undertaken for DOC. 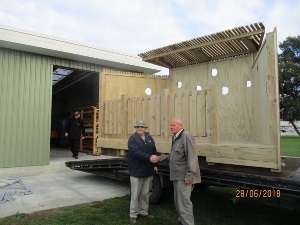 It was built over several weeks and has now been delivered to Aramoana on the Central Hawkes Bay coast. Some art work was still to be fitted when it left the shed. In the third pic Paddy hands it over to the DOC representative. 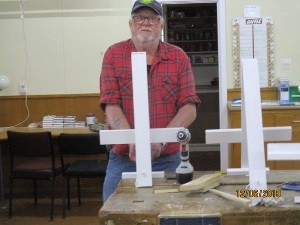 Brian finishing off one of six wreath holders produced for the RSA. They will be used on occasions such as Anzac Day. 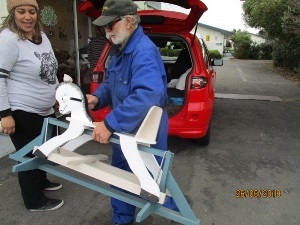 Mike hands over 2 rocking horses that he made to a delighted recipient. They should give some lucky youngsters a lot of pleasure. 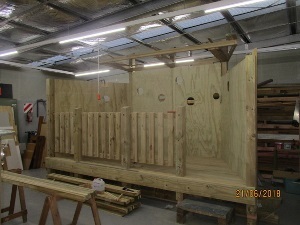 Other Projects Recently Completed for HB People and Organisations. May 17 On site tree support - Napier Family Centre. 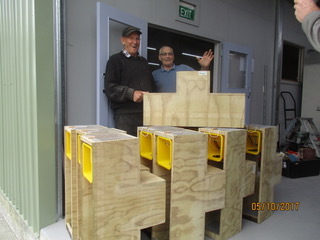 May 17 Flower boxes made from fence posts - Matilda Hepi. July 17 Letter box fitted - HB Basketball Assn. Nov 17 Rebuilt Victorian mirror frame - donated to Cranford Hospice as a fund raiser.